June is Greek Heritage Month in Vancouver and Greek Day on Broadway is one of the annual festivals that occur this month. For some reason or another, I was always busy on that day, but I finally managed to attend the festival on Sunday! It was a super sunny day too, so crowds and crowds of people came down to enjoy the weather and the festivities on Broadway between McDonald and Blenheim. The streets were filled with delicious smelling Greek food. Every single vendor there had a line up. I met up with W.W. and A.H. and had the Lamb Souvlaki Wrap the Nu Greek booth. The cooks were busy grilling the meats and pita breads at the back of the booth. It smelled so good! The wrap was delicious! 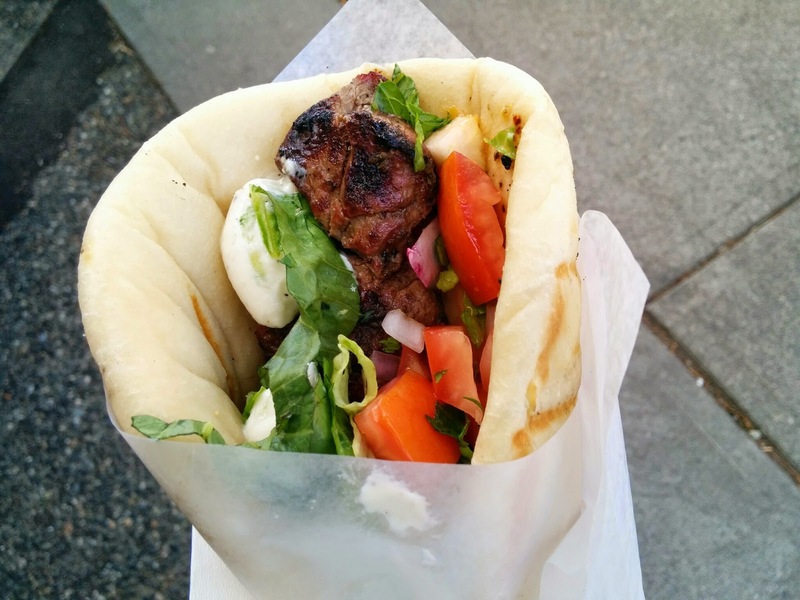 The pita was so soft and warm and the lamb wasn't gamy at all. It was seasoned well and cooked just right. YUM! After lunch, we walked around looking at all the booths and watched a Greek dance by the stage.